Each game of last season’s National League Championship Series brought its own unique set of blunders for the Cubs, but the one constant was the collective groans of the Bleacher Bums whenever Mets closer Juerys Familia would run out to pitch the ninth. The moment he took the mound for the Mets, everything was over. Game 1 took him 21 pitches, Game 2 17, Game 3 only 14, and Game 4 21. Efficient and deadly, that’s exactly what you want out of a closer in October: a human drone strike. That’s exactly what the Cubs lacked. The Cubs, with their two MVP leaders at the corners, reigning Cy Young winner on the mound, and Gold Glove defense all around the diamond, had a gaping hole this season and last: their bullpen. 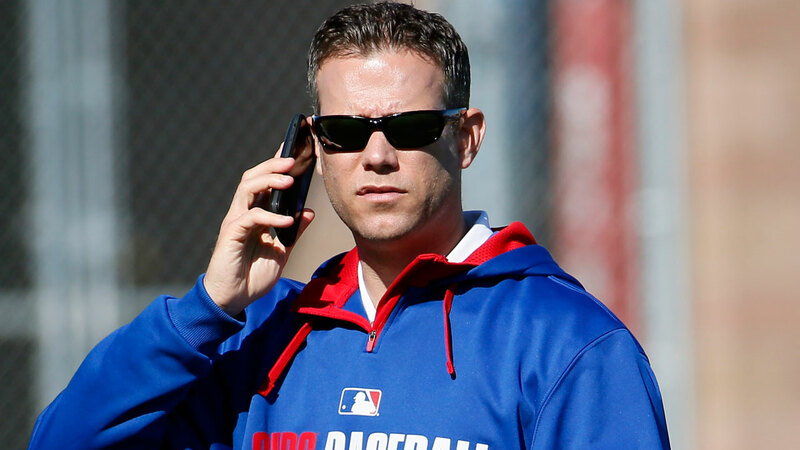 So Theo Epstein and Jed Hoyer completed their years-long transformation of hole-filled Swiss into cheddar, shipping a package of prospects to the Bronx for Aroldis Chapman. Yes, that Aroldis Chapman—the one who hit 105 MPH on the radar gun just a week ago, the one who has not surrendered a run to the Cardinals since 2011, the one who is the single most terrifying closer in baseball—is now a Chicago Cub. Somebody put the champagne on ice, please. Yet imagining Chapman striking out the final batter of the World Series doesn’t leave my eyes wet with tears of joy like the image of that last strike usually does. It just leaves me feeling…weird. That’s because Aroldis Chapman is, by all accounts, a horrible person. This offseason, Chapman’s girlfriend accused him of choking her and then firing eight shots into the wall of their garage as she hid in the bushes. She eventually dropped the charges, as many domestic violence victims do. The MLB suspended him for 30-games, and Chapman insisted he did nothing wrong. This is a Cubs team full of lovable goofballs, and that’s by design: Theo and Jed have always stressed the value of character in a clubhouse. It’s a team built around players that act nothing like Chapman, and that’s why they’ve been so easy to root for. You can cheer them unconditionally. Or at least you could until this morning. As a fan, your identity becomes wrapped up in your team’s. It’s the fundamental reason we follow sports: to belong to something bigger than ourselves. You sacrifice a part of yourself and get a nation of fellow fanatics’ heart in return. It becomes a defining characteristic, for better or worse: I’m a Cubs fan, so I’m well-versed in dealing with adversity. This Cubs team is goofy, so I hop and dance around while watching them. When they get a hit, I rub my hands on my head, just like them. The Cubs have never made me feel like a winner, though. That’s why Chapman is here. I’ve also never felt so conflicted. You stick with your team through every win, loss, and trade. You defend them in debates with friends, and you wear their gear. I’ve done all that for the Cubs that my entire life, and now, when they add an alleged wife beater to their club, that wife beater becomes a part of my life too, someone I have to deal with and reconcile every single day. I have to take on the weight of his girlfriend’s pain. I’m asked to compartmentalize, to compromise, and to focus on Chapman the player and not Aroldis the man, but I can’t do that. I’m not sure if winning is worth the compromise. I can try my best to forgive, but how could anyone forget?